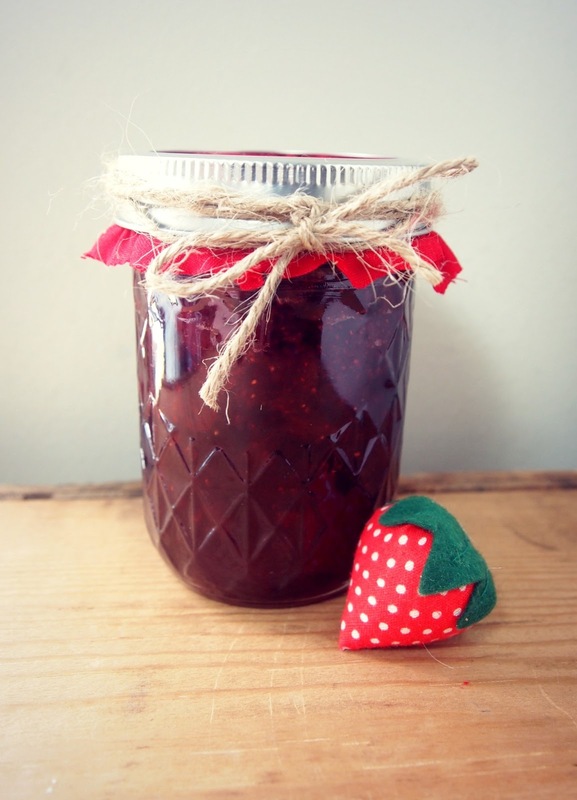 New Wave Domesticity: Jam Sessions : Basics : Let's Make Some Jam! We've talked about the canning lingo and we've talked the tools that you need to get started, so let's make some jam and get to canning, shall we? It seems pretty fitting to start with some good old fashioned strawberry jam! 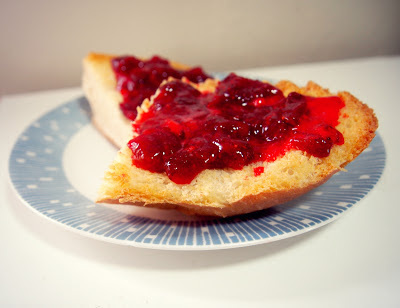 There are few things to me that are more simplicity beautiful than homemade strawberry jam. It's soft sweetness brings me back to beautiful childhood memories. Once you make your own strawberry jam, you will never want to buy grocery store jam again. This recipe is my tried and true secret strawberry jam recipe. I've been perfecting this recipe for almost a decade & it even won me a red ribbon when I entered it in the Oregon State Fair a few years ago! It's really a simple take on an old fashioned recipe with just a few dashes of updating. There are two parts to this process - making the jam and then the canning process. Both parts are simple and just require a few basic steps. The wonderful thing is that once you get that second part down, that is what you need to be able to make any kind of jam, jelly, relish, or pickle your heart desires. This may seem like a lot, but don't be intimidated! The key to making jam successfully & stress-free is preparation. Once you get started, you need to work pretty quickly & the steps require a lot of attention, so getting prepared will help you tremendously. The first preparation is your fruit. Hull your berries and roughly chop. Mush with a potato masher - just enough to break it all down, but still leaving some nice whole chunks of fruit in the mix. * Measure it out and also measure your sugar and set aside. Next, you want all of your supplies ready. You want everything you you need right at your fingertips before you start. Click here for the hardware guide to see what tools you need. Heat your waterbath (aka large pot of water with your canning rack inside) over high heat, it will take a bit of time to get to full boil. As soon as it reaches a full boil, you want to put your empty jars in. They need to be in the hot waterbath for about 10 minutes or so to sterilize them. You will remove them as soon as it is time to can. You can also use your dishwasher if there's a sterilization and heat hold setting. Mix 1/4 cup sugar with 1 box of pectin. Stir together with a fork. I add the sugar to help keep the pectin from clumping. Combine your berries, lemon juice, and pectin in a large pot. Add the balsamic & salt - these are both my secret ingredients to help round out the flavors just a bit and boost the natural strawberry flavor, but they aren't traditionally added, so feel free to skip them. Cook on high heat, stirring often. Bring to a rolling boil. (this is rolling boil #1). Once you have a nice boil, add all the sugar and stir well. Keep on stirring. This is the part where you do not want to take your eyes of your jam because it will be quick to burn. Bring back to a rolling boil. (that is rolling boil #2). Boil, stirring constantly, for one minute. After one minute, your jam will start to thicken, but it will be a little hard to tell just what the final cool consistency will be since it is so hot. At this point you want to test for gel to make sure it set to that perfect jammy texture. Your jam will have a top layer that is foamy and lighter colored. This is totally normal, just skim of this layer with a spoon and put it into tupperware. The foam is delicious and perfectly safe to eat, it can just make your jam look a little unsightly and discolored if you leave it in, so skim and keep it in the fridge to enjoy first. *I like to do this step the day before. It is a big project to take on, so I think it is nice to have that taken care of in advance. If you prepare the fruit in advance, 1/2 cup of sugar to the chopped berries & store in the fridge to allow it to macerate and really absorb some sugar and create lovely maceration. It's not necessary, but it's a nice touch. Congratulations! You made jam! You could stop here and just put your batch in the fridge and devour it within a few weeks, but what is the fun in that? This is a canning lesson, so let's can it! This is where the magic happens that lets your jam last in your cupboard for up to a whole year. It's actually way easier than the jam part...just a few quick steps! Once you have this basic canning process down, you can pretty much can anything! The very same steps are used to can pickles, jelly, chutney, sauces, ect. The difference will just come in the processing time, so be sure to just follow your recipe. You already started sterilizing your jars while you were making jam, so they should be ready to pull from the water. Do this right before you are ready to can because you want the jars to be nice and hot and freshly sterilized. Once those jars are out, go ahead and ladle your hot jam into hot, sterilized jars. You can use the jar funnel to make this easier and less messy. Leave 1/4" headspace. 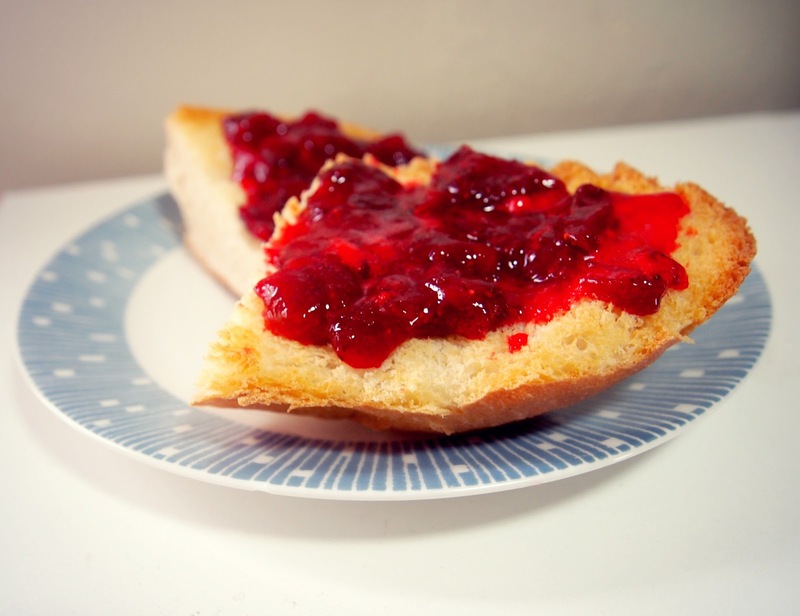 Wipe the top of the jars with a wet paper towel to remove any excess jam. A messy top could make it difficult for the jars to seal. Get your lids in a small pot of hot (not boiling) water for a few minutes. This sterilizes your lids also helps to soften the rubber around the edges that will create the seal. Pull the lids out of the boiling water using your magnetic lid lifter. Place them on top of the jars. Screw your bands around the top so that they are nice and tight (careful, the jars are hot, so an ovenmit or kitchen towel comes in handy to protect you hands). Use your jar grabber to put your jars into the boiling waterbath. Be sure they are covered with at least 2" of water. Generally, you process jam for 5-15 minutes depending on your altitude. If you at an altitude of lower than 1,000 feet above sea level - 5 minutes, 1,000-6,000 ft - 10 minutes, 6,000+ ft above sea level - 15 minutes. The processing time is important because it is what creates the seal, but you don't want to over process because it will overcook the jam. When in doubt, the extra five minutes won't hurt. Remove your jars and let them sit on the counter at room temperature for at least 24 hours. They will make some popping noises during this time, but that is ok! The next day, check your jars for a seal. If they are fully sealed, there will be no give to the jar lid. If they did not seal, it will make a popping noise when you press down and you will feel the lid flex. If this happens and they did not seal, that is ok too! Just put that one in the fridge an eat it first. It will stay in the fridge for about a month. Once cooled, they are ready to store in your pantry for up to one year or to be given as lovely gifts! See? It's not so hard! I hope you will give it a try in your own home and please don't hesitate to leave a comment and ask any questions you might have! And don't forget, there is still a few more days to enter to win all the supplies you need to make jam at home! I'm sterilizing jars as we speak...it's my very first time. I'm going to be canning some cooked squash chutney. I think it's called chutney...? Anyways, I put the jar holder thing in wrong, its on top of the jars instead of inder. I'm not sure if I have the pressure cooker weight thing on right, and I put the jars in she I turned the stove on instead of waiting until I'm at a boil! I hope I don't ruin everything! I assume there's a learning curve here...I'll get it eventually. I'm hoping to get enough strawberries this year to do jams!! I know I'll have millions of blackberrys from my uncles garden. So I'll be trying your recipe soon. Thank you for this series, it's nice to have some visual help, especially since the book I have is for experienced canners. I don't even read it any more because its too hard to understand. I just look at thepictures! Oh! You are jumping right into pressure canning! That is bold & exciting, I really hope it turns out! I don't do a lot of pressure canning because it is just a bit more tricky that this basic hot water bath method, but for canning squash the pressure canner is a must since it's a low acid food. It should be fine to put the jars in before it reaches a boil, just be sure that once it gets to a boil that is when you start counting your 10 minutes to get them hot enough and sterile. If you are worried that it didn't seal or get enough pressure, my best advice would be to stick them in the fridge. Not getting enough pressure means the water cannot get hot enough to kill all the bacteria to make them safe to store. The lovely thing about using high acid foods and a waterbath canner (the method I showed above) is that it's a little more fool-proof...boil = hot enough. I really hope your chutney works out! Tell me how it goes! I also really hope you get to make some blackberry jam, I am so glad you found the post helpful! I <3 canning and I love being able to help others get into it too! You make it look so easy. I tried to make some blueberry jam last summer, and while it tasted so so good, it wasn't thick at all. In fact we ended up eating it over ice cream. Not that ice cream sauce is a bad thing, it's just not the over biscuit kind of love I was expecting. You've inspired me to try again, and now I just need to go pick the blueberries! Loving your blog!